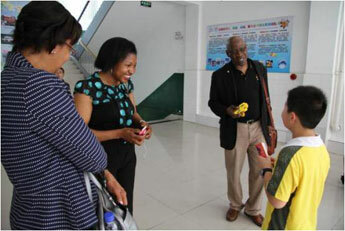 On May 10th, Dr.Joseph, Dean of the Education Institute of Eastern Michigan University and other seven people who were guided by Director Tian Chong of Beijing Weiming Education Group International Exchange Center and Doctor Yuan Shengquan of Teaching and Research Department of Preschool Education arrived at the Affiliated High School of Peking University Wuhan Weiming Experimental School for inspection and exchange. EMU delegation consists of Dr. Joseph, the Dean of the Education Institute, Dr. Akosua Dow, the Administrative Director, Dr. David M. Anderson, the Deputy Director of Education Institute, Dr.Edwin Joseph, the Geography and Information Expert, Dr.Karen Menke Paciorek, the Professor of Early Childhood Education, Michael J. Paciorek, the Professor of Physical Culture Institute, Dr. Alane Starko, the Professor of Educational Psychology and Eva Ye, the Doctor of Senior Education Student Affairs. 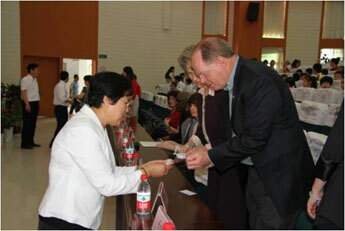 At 8:00 in the morning, the American guests arrived at school and Principal Zhou and other middle-level leaders received them warmly. The children of the Drum Team welcomed the guests from afar in the most passionate and unique way. 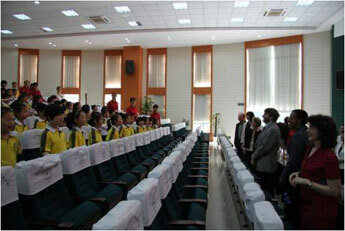 With the joyous atmosphere, EMU delegation walked together with school leaders to Weiming Lecture Hall to attend the ceremony of unveiling the plaque. 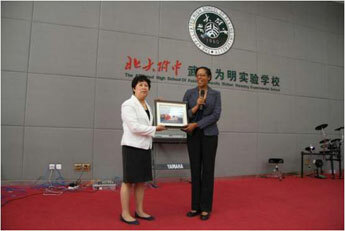 The ceremony was held by Director Liu from school office and Ms. Zhang Jie of Primary Section in Chinese and English together; Principal Zhou delivered a passionate speech to welcome EMU delegation warmly and show expectation of international exchange cooperation with Eastern Michigan University. 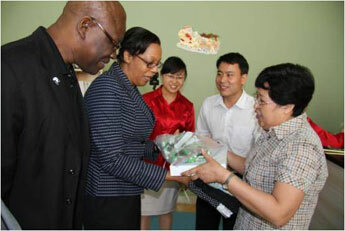 Leaders of the two schools exchanged presents. 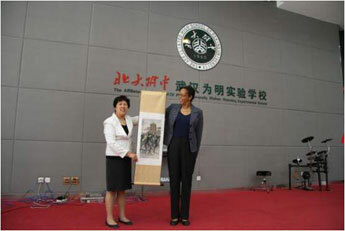 Principal Zhou gave a silk painting “Yellow Crane Tower” to Eastern Michigan University on behalf of the school, while Dr. Joseph on behalf of Eastern Michigan University Education Institute gave a painting framed elegantly with bridge and both countries’ flags which stands for friendship. 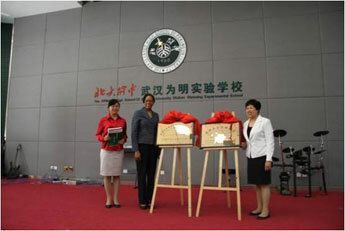 Both leaders unveiled the plaques, “Teacher Practice Base for Eastern Michigan University” and “Cooperative School Having Direct Admission Program with Eastern Michigan University” together, which marked that our school became the teacher practice base of Eastern Michigan University and owned the direct admission program with Eastern Michigan University. In the future, outstanding graduates from Education Institute of Eastern Michigan University may practice and work in our school, and our high school graduates may attend American universities for study through the direct admission project. Later, EMU delegation watched the programs carefully prepared by Xiaobaihua Choir, Primary Pearson International English Classes and the students from Middle School Section. Children’s generous and cheerful performances, assertive personality, happy smiles, graceful dances and wonderful singing won warm applause. 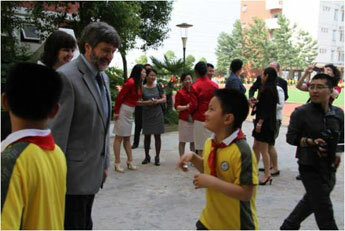 The American guests involved in the program to interact with the children, sharing the happiness. After wonderful programs, EMU delegation watched the big breaks of Primary Section. 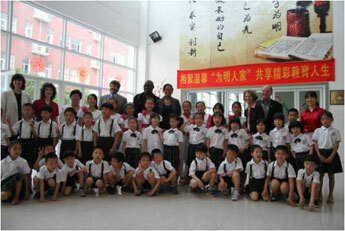 Seeing the children’s sunny smile and uniform movements, they nodded and smiled. 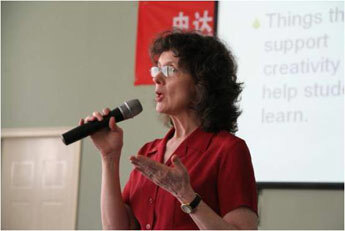 Then the delegation walked in the classroom to observe and learn Ms. Zhao Jing’s class of international English classes and the English class of Elin, a foreign teacher. 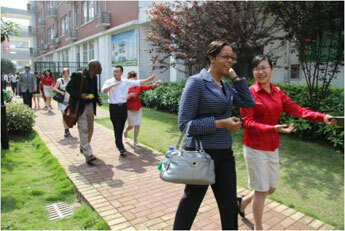 After having lunch, EMU delegation took a brief rest in Home of Weiming, and then watched the school’s advertising video, “Academy, Parks and Homes” to gain a deep and detailed understanding of our school. 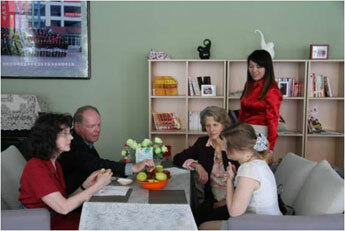 Then, they warmly communicated with teachers attending the seminar and analyzed the classes. At 12:40, after a brief introduction of the host, Dr. Starko, the Professor of Psychology gave a report on the theme of “Creativity in the Classroom” and gave a wonderful speech on what (what’s the creativity in the classroom), why (why is the creativity in the classroom needed) and how (how to cultivate the students’ creativity) . 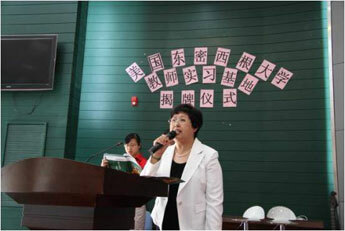 The whole speech was like a spiritual feast that brought a creative thinking brainstorming to the teachers attending. 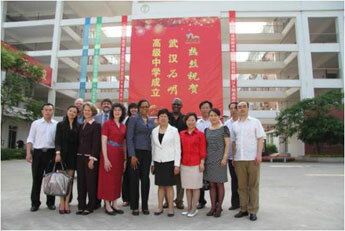 The visit of EMU delegation was a significant breakthrough of the school in internationalized education. The establishment of teacher practice base provides the outstanding graduates of EMU Education Institute with more opportunities to exchange in our school in the future. 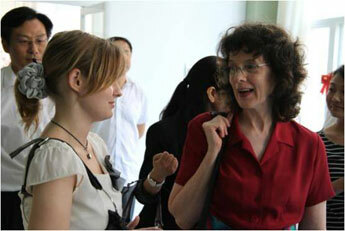 The direct admission program will help students who desire for studying abroad to fulfill their dreams! In May, flowers in the Beautiful River City are changing into fruits as the summer is coming. In our school, we are having a significant event here. Just now, Dr. Joseph, the Dean of the Education Institution and us unveiled the plaque together, which marks our school formally become the teacher practice base of Eastern Michigan University and the school enjoying its direct admission program. The two plaques make perfect sense. This is a great victory for the internationalized education and a new milestone in the history of the development of our school. 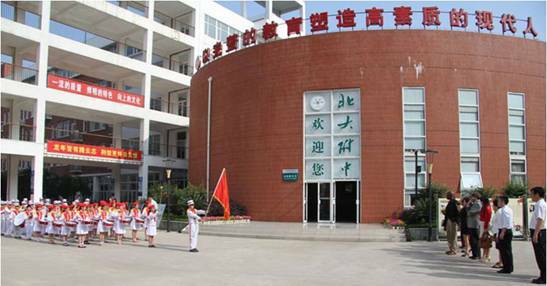 It is necessary for us to increase the international cooperation as we are making great efforts to be a high-quality international school and cultivate modern talents with Chinese spirits and international vision. Eastern Michigan University, an influential comprehensive university with more than 150-year history, is among the best universities. 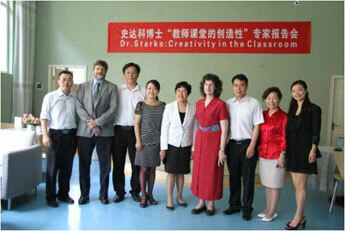 It has wide experience to cooperate with schools from other countries. We are honored to cooperate with it. 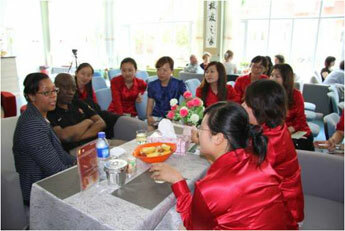 I hope we have more opportunities to communicate and cooperate in the future. Outstanding teachers of the EMU Education Institute exchange here and bring us advanced educational philosophy and teaching methods. I hope we can do more in the individualized development, the variety of courses and the diversified development of graduates. 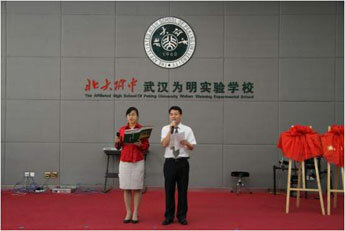 I hope the direct admission program will help students who desire for studying abroad to fulfill their dreams! Thank you! Hope you all have a good time in China!